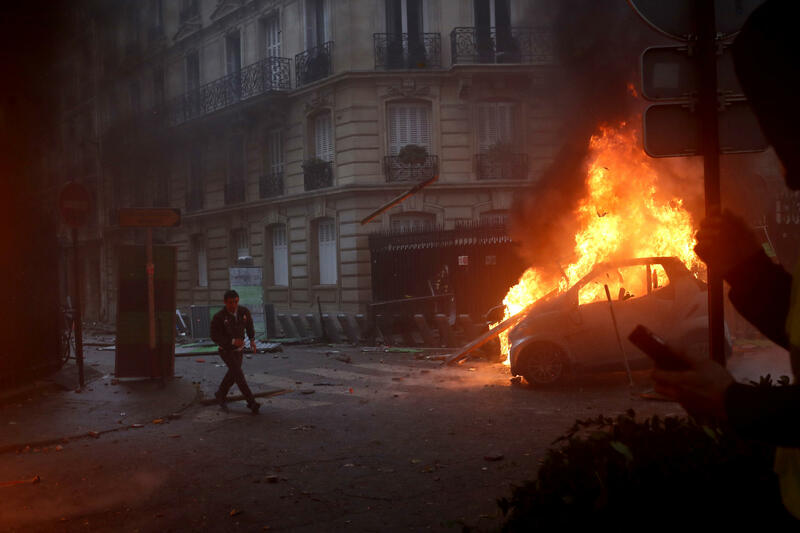 A demonstrator runs past a burning car during a demonstration in Paris on Saturday, Dec. 1, 2018, against an increase in fuel taxes. Clements, who is part of Western's Climate Change Working Group, will be part of a panel discussion at Western Michigan University – The True Cost of Climate Change and its Policy Implications. It begins at 2:00p.m. Friday afternoon February 15th in Room 3508 of Knauss Hall. Nordhaus calls for a tax on carbon. He said in a 2014 story for NPR “We need to put a price on carbon so that when anyone, anywhere, anytime does something that puts carbon dioxide in the atmosphere, there’s a price tag on that.” But Clements says the Yale University professor’s proposal is inadequate. He says Nordhaus’ model severely underestimates the future costs associated with climate change. Clements calls Nordhaus “the leading climate change economist.” He says Nordhaus created the models that other economists now use to measure the economic impact of climate change and what is known as the social cost of carbon. But Clements says that Nordhaus’ proposal for a carbon tax is not enough to slow the rise of climate change. A carbon tax that dramatically increases the cost of gasoline or electricity is likely to be a “tough sell politically” acknowledges Clements. But he says Nordhaus’ work has made it even tougher to get support. Western Michigan University is working on a new, detailed study of its carbon emissions, the first in several years. The school’s latest greenhouse gas inventory will look at major factors such as commuting and generating power. It will also account for impacts from solid waste and even from student air travel for study-abroad programs. WSW: What Does A New Michigan Governor Mean For The Great Lakes? Michigan will have a new governor in 2019. Senior Correspondent for Detroit Public Television’s Great Lakes Bureau Gary Wilson says regardless of who is in office other states in the region look to Michigan as a leader on water and environmental issues.